Last month, students in grades 7 and 8 participated in a prevention workshop on digital identity. 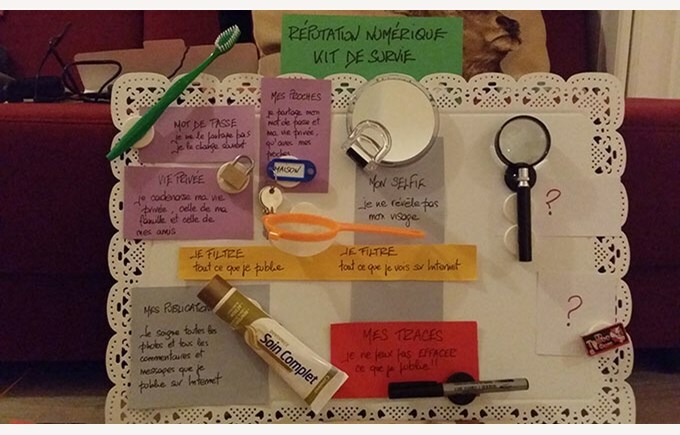 The three-part activity entitled “La réputation numérique: Mon image, ce que j’en fais” (Digital reputation: How I can manage my profile) was led by Mrs. Maria Moschou. During the first exercise, the students analysed the digital profile of a young girl who had been active on social media over several years. They learned that consequently anybody could access this information, and that it is hard to erase. Next, Mrs. Moschou presented what she called a survival kit for social media. Everyday objects served as metaphors to demonstrate how to protect one’s digital identity on social media platforms. For example amongst other objects, the tooth brush represented a password which should not be shared and be changed regularly. Lastly, the students learned how to present themselves differently on social media. They took pictures of their classmates in groups, but without showing any faces.